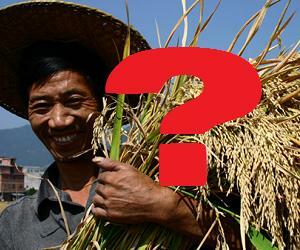 Transgenic rice has been approved in China since 2009, but plans to unroll GM crops seem delayed. Even as China rushes to expand its crops to feed its growing populace, it faces regulatory snags and pitfalls. The State Council recently discussed efforts to innovate China’s industrial agriculture while keeping it independent of multinational corporations. Genetically modified crops are a big part of these plans. The nation hopes to increase seed production first with non-GM and then GM strains of rice and corn to offset dependence on major seed selling companies like Pioneer. Yet at the same time, China is facing regulatory problems as it seeks to roll out transgenic phytase corn for animal feed in the near future. Concerns about the safety of GM foods in China are also persistent both inside and outside the country. Will China manage to grow large amounts of genetically modified rice and corn in the near future? Plans to rapidly start widespread cultivation seem less likely than they did a year ago. Yet the general attitude of the State Council, and the continued investments in research, make China’s future in genetically modified crops seem very certain. According to Reuters Africa, GM corn is facing significant regulatory issues in China. Phytase corn, developed in China, is aimed at helping animals digest phosphorous in the grain. That advantage could lead to quicker growth in the pigs and cattle that consume the corn and may reduce the environmental impact of their waste as well. Yet China’s approval of the corn in 2009 does not exclude it from general regional trials for seed. Those trials reportedly base approval on crop yields not advantages in animal digestion and environmental gains. Proponents fear that getting the phytase corn into the field will require more coordination between levels of the government than currently seen. At the national level, the State Council has upped its efforts to make China’s agriculture independent of foreign influences. Currently, Du-Pont’s Pioneer brand of corn seed is sold extensively throughout the region. The State Council aims to build large ‘seed banks’ that could supply the country with enough domestic seed to cover the majority of its needs. They’ve set a goal of 2020 for the creation of these seed banks. It’s anticipated that some of this seed, perhaps a large portion, will incorporate China’s biotechnological innovations in genetically modified crops. Yet as China set the 2020 goal for seed production, officials and scientists were quick to point out that non-GM seed would dominate their efforts for the next five years, and perhaps the five years after that as well. The near term future of GM rice and corn seems rather well delayed. The International Service for the Acquisition of Agri-biotech Applications (ISAAA) recently released a report detailing the use of GM crops around the world in 2010. While the amount of arable land dedicated to these organisms increased by 10% globally, China actually experienced a 5% drop from 2009 – down to 3.5 million hectares. It would be foolish to assume, however, that these recent drops and hurdles in China’s adoption of transgenic crops mean that the nation won’t eventually adopt GM strains en masse. The nation has invested heavily in GM technology with facilities like the Biotechnology Research Institute of the Chinese Academy of Agricultural Sciences being both well-funded and growing. Transgenic crops not meant for human consumption, namely cotton, have already enjoyed widespread success in the nation. GM corn looks delayed, GM rice may be as well, but China’s adoption of these plants is a matter of when, not if. Depending on your opinions about genetically modified food that may be a good or bad thing. Opinions on GM crops aside, however, we should all agree that China’s dedication to keeping its people well fed is going to require them to come up with innovative solutions to their agricultural problems. As they seek independence from foreign corporations and deal with increased industrialization and a growing population, domestically created GM crops seem like an inevitable solution. We’ll have to wait and see, however, when that solution will actually arrive.